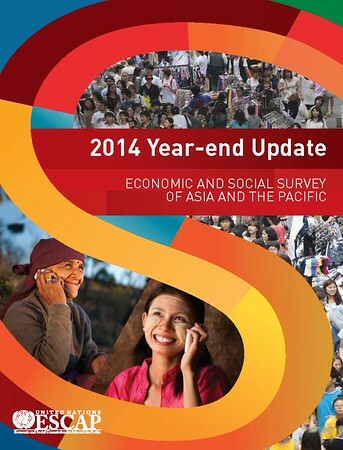 Asia and the Pacific is forecast to see a moderate increase in growth in 2015. This will be driven by better growth in a range of developing economies, aided by structural reform programmes which are likely to improve the domestic business environment. Several exporting economies will exhibit relatively unchanged growth at moderate levels, with a positive factor being the seemingly sustained recovery in the United States, although slow growth in the eurozone and Japan will remain a challenge. At the same time, moderate or decreasing inflation in several economies could allow them to maintain accommodative monetary policies to support growth. Moreover, the dramatic recent decline in oil prices is likely to have significant macroeconomic policy implications, both positive and negative, depending on the level of commodity-dependence of each economy. Despite a fairly positive outlook, the region faces a number of risks and challenges. These include domestic structural concerns and the likely impact of capital volatility. There are two key cross-cutting domestic structural challenges that affect the supply capacity of economies – infrastructure deficits and labour market imperfections. Shortage of infrastructure has prevented growth in manufacturing and trade for domestic and export markets across the region. Lack of human capital formation through education and skills training that meet the needs of higher value-added business sectors has led to insufficient creation of decent jobs A short-term challenge to macroeconomic stability is the impact of monetary policies of developed economies on capital markets in the region – particularly the ongoing monetary policy normalization by the United States. The Year-end Update of ESCAP’s annual flagship publication, the Economic and Social Survey of Asia and the Pacific, considers the implications of these challenges for policymakers in the region. The key messages are that addressing structural challenges will involve a mix of domestic and regional policies. Examples of such policies are increasing the contribution of the private sector and establishing regional financial intermediation institutions for infrastructure development. Similarly, an appropriate mix of monetary and fiscal policies, together with the supportive role of macro-prudential measures, will help to manage developments arising from capital market volatility and falling oil prices.